You have a computer that runs Windows 7. The Encrypting File System (EFS) key is compromised. You need to create a new EFS key. Which command should you run? 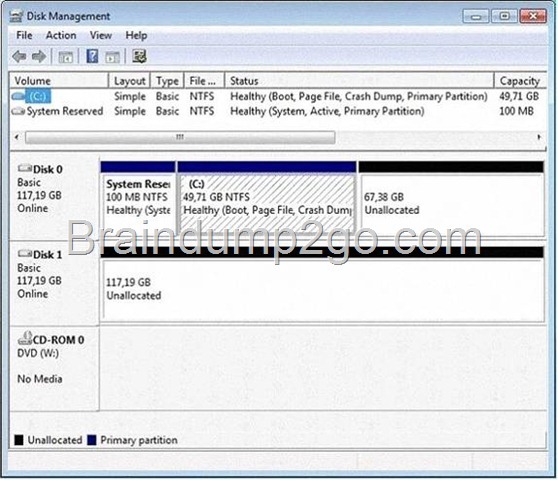 Displays or alters the encryption of folders and files on NTFS volumes. Used without parameters, cipher displays the encryption state of the current folder and any files it contains.Administrators can use Cipher.exe to encrypt and decrypt data on drives that use the NTFS file system and to view the encryption status of files and folders from a command prompt. The updated version adds another security option. This new option is the ability to overwrite data that you have deleted so that it cannot be recovered and accessed.When you delete files or folders, the data is not initially removed from the hard disk. Instead, the space on the disk that was occupied by the deleted data is "deallocated." After it is deallocated, the space is available for use when new data is written to the disk. Until the space is overwritten, it is possible to recover the deleted data by using a low-level disk editor or data-recovery software.If you create files in plain text and then encrypt them, Encrypting File System (EFS) makes a backup copy of the file so that, if an error occurs during the encryption process, the data is not lost. After the encryption is complete, the backup copy is deleted. As with other deleted files, the data is not completely removed until it has been overwritten. The new version of the Cipher utility is designed to prevent unauthorized recovery of such data. /K Creates a new certificate and key for use with EFS. If this option is chosen, all the other options will be ignored. By default, /k creates a certificate and key that conform to current group plicy. If ECC is specified, a self-signed certificate will be created with the supplied key size. /R Generates an EFS recovery key and certificate, then writes them to a .PFX file (containing certificate and private key) and a .CER file (containing only the certificate). An administrator may add the contents of the .CER to the EFS recovery policy to create the recovery for users, and import the .PFX to recover individual files. If SMARTCARD is specified, then writes the recovery key and certificate to a smart card. A .CER file is generated (containing only the certificate). No .PFX file is genereated. By default, /R creates an 2048-bit RSA recovery key and certificate. If EECC is specified, it must be followed by a key size of 356, 384, or 521. You have a portable computer that runs Windows 7. The computer is configured to keep an offline version of files located in a network share. You need to identify whether you are working on an offline version of a file. A. From Sync Center, click View sync partnerships. B. From Action Center, click View archived messages. C. From Windows Explorer, select the file and then view the toolbar. D. From Windows Mobile Device Center, click the Connection settings. To find out whether you're working offline: Offline files turn on automatically if you lose your network connection. A copy of your file is copied to your computer, and once your network connection is re-established, the two copies will be synchronized. To find out if you're working offline, do the following. 1. Open the network folder that contains the file you are working on. 2. Check the Details pane at the bottom of the window for the status. If the status is offline, you are working with a copy of the file on your computer. If the status in online, you are working with the file on the network. You mark a folder as Always available offline. You need to verify that an offline copy of the folder has been created on the computer. What should you do? A. Open Sync Center and review the status. B. Open Action Center and review any messages or issues. C. Open Windows Mobile Device Center and review the status. D. Open Network and Sharing Center and review the status for the local area connection. What is Sync Center?Sync Center allows you to check the results of your recent sync activity if you've set up your computer to sync files with a network server. This allows you to access copies of your network files even when your computer isn't connected to the network. Sync Center can tell you if the files synced successfully or if there are any sync errors or warnings. NoteSync Center is designed to help you sync with files in network locations. If you want to sync a mobile device with your computer, such as a mobile phone or portable music player, Windows gives you several other options. You can install the sync software that some manufacturers include with their device, or you can use the new Device Stage feature in this version of Windows if your device supports this feature. For more information, see Sync music, pictures, contacts, and calendars with a mobile device. Your company has a server that runs Windows Server 2008 R2. The server is configured as a remote access server. The external firewall has TCP port 80 and TCP port 443 open for remote access connections. You need to record when an incoming connection is allowed through Windows firewall. A. In Local Group Policy, modify the audit policy. B. In Local Group Policy, modify the system audit policy. Windows Firewall with Advanced Security can be configured to log events that indicate the successes and failures of its processes. The logging settings involve two groups of settings: settings for the log file itself and settings that determine which events the file will record. The settings can be configured separately for each of the firewall profiles. You can specify where the log file will be created, how big the file can grow, and whether you want the log file to record information about dropped packets, successful connections, or both. Log successful connectionsUse this option to log when Windows Firewall with Advanced Security allows an inbound connection. The log records why and when the connection was formed. Look for entries with the word ALLOW in the action column of the log. that runs Windows 7. Computer1 is configured to obtain updates from Server1. You open the WSUS snap-in on Server1 and discover that Computer1 does not appear. You need to ensure that Computer1 appears in the WSUS snap-in. What should you do? A. On Server1, open Windows Update then select Check for updates. B. On Server1, run Wsusutil.exe and specify the /import parameter. C. On Computer1, open Windows Update and then select Change settings. D. On Computer1, run Wuauclt.exe and specify the /detectnow parameter. You discover that standard users are never notified when updates are available. You need to ensure that standard users are notified when updates are available. A. Select Allow all users to install updates on this computer. B. Specify an intranet Microsoft update service location in Group Policy. C. Change the Startup Type for the Windows Update service to Automatic. D. Select Give me recommended updates the same way I receive important updates. 1. Click to open Windows Update. 5. To get recommended updates for your computer, under Recommended updates, select the Give me recommended updates the same way I receive important updates check box. 6. To allow anyone using the computer to make updates, select the Allow all users to install updates on this computer check box. This applies only to updates and software that are installed manually; automatic updates will be installed regardless of the user. 7. Click OK. If you're prompted for an administrator password or confirmation, type the password or provide confirmation. Your computer's disk configuration is shown in the exhibit. You need to ensure that you can create a striped volume on the computer. A. Add an additional hard disk. B. Convert all disks to dynamic disks. C. Install a digitally-signed disk driver. D. Set the Startup Type of the Virtual Disk Service (VDS) to Automatic. You can create striped volumes only on dynamic disks. Striped volumes cannot be extended. You can create a striped volume onto a maximum of 32 dynamic disks. Backup Operator or Administrator is the minimum membership required to complete the actions below. At the DISKPART prompt, type list disk. Make note of the number of the disk where you want to create a striped volume. You have a computer that runs Windows 7. The computer is configured to automatically download and install updates. You install Microsoft Office 2007. Tool into the Updates folder. Update Site from applying policy. 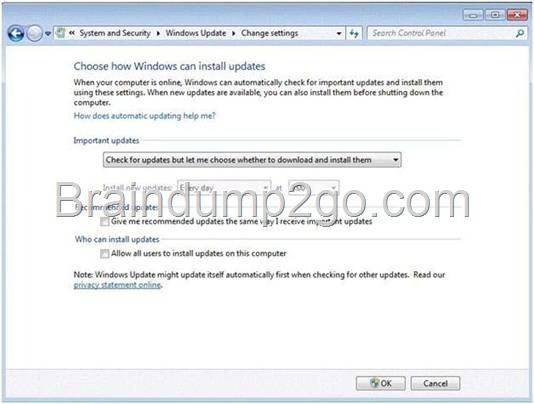 Use Windows Update to Check for Updates to other Microsoft Products By default, Windows Update can download and install updates for Windows 7 and features that are part of the operating system (such as Internet Explorer). You can also merge the functionality of Microsoft Update--a service for managing updates to Microsoft Office and several other Microsoft products--into Windows Update so that you no longer need to visit Office Online to get updates.If you do not already have Windows Update integrated with Microsoft Update, you will see the message "Get updates for other Microsoft products" on the Windows Update home page. To enable checking for other products, click the Find Out More option shown beside this message. This will take you to the Microsoft Update site for some quick installation steps. You only need to do this once. Thereafter, the Windows Update home page will indicate that you receive updates "For Windows and other products from Microsoft Update."